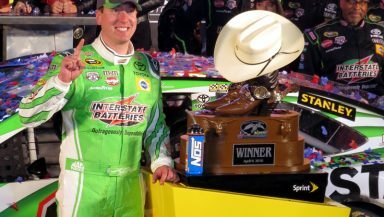 Kyle Busch continued his run of excellence in NASCAR with his win in the Lone Star State. The driver of the No. 18 Joe Gibbs Racing Toyota took the lead with 32 laps to go and drove on to score the victory in the Duck Commander 500. It’s his 36th career win, his second of the season, second at Texas Motor Speedway and the second weekend sweep this season. Dale Earnhardt Jr. brought his No. 88 Hendrick Motorsports Chevrolet home to a runner-up finish. Joey Logano rounded out the podium in his No. 22 Team Penske Ford. Jimmie Johnson’s run of three-straight wins at Texas came to an end after a collision with race winner Busch on pit road early in the race and a fourth-place finish in his No. 48 HMS Chevrolet. Chase Elliott led one lap on his way to rounding out the top-five in his No. 24 HMS Chevrolet. Martin Truex Jr. had the car to beat this morning after leading 142 of the 334 laps, but opting to stay out on the final caution ultimately cost him a chance at victory and forced the driver of the No. 78 Furniture Row Racing Toyota to settle for a sixth-place finish. Carl Edwards led 124 laps and fell down a lap after pitting for a loose wheel, but the driver of the No. 19 Joe Gibbs Racing Toyota worked his way back up and finished seventh. Kasey Kahne ended a run of bad finishes with an eighth-place finish in his No. 5 HMS Chevrolet. Kurt Busch finished ninth in his No. 41 Stewart-Haas Racing Chevrolet. Kevin Harvick led one lap on his way to rounding out the top-10 in his No. 4 SHR Chevrolet. The race lasted three hours, 37 minutes and 16 seconds at an average speed of 138.355 mph. There were 17 lead changes among eight different drivers and seven cautions for 41 laps.